WC-152-162 : Wall Charger for 12 volt battery packs for STANDARD, ADI, JRC. Charge Plug polarity is center NEGATIVE to match the battery. ADI (AT-201); JRC NBB-487 (for JHP-500 & JHP-520 radios). Typical full re-charge time is overnight. Plugs into 110-120VAC wall outlets. 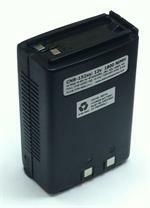 CNB-152xh: 12 volt 1200mAh LONG LIFE Ni-MH rechargeable battery pack for STANDARD, ADI, JRC, Heath, & Relm radios. Replaces CNB242, CNB244A, CNB-152, RBP-120, NBB-487, etc. CNB-152xs : 12volt 1800mAh LONG LIFE Ni-MH battery for STANDARD, ADI, JRC, etc. CNB-152xs : 12v 1800mAh rechargeable long-life Ni-MH battery for Standard, ADI, Heath, Relm, JRC, etc. Replaces original part #s RBP-120, CNB-152, CNB-242, etc. Re-charge with a plug-in Wall Charger (WC-152) or desktop charger (CSA-181). CNB-162xh: 12v 1200mAh Ni-MH battery for STANDARD C168A, C468A, C178A, C568A, etc. CNB-162xh: 12 volt 1200mAh long-life Ni-MH battery for STANDARD radios such as C168, C468, C178, C568 etc. Battery is 3" long. Re-charges with WC-152-162 wall charger, or with the CSA-181 desktop rapid charger.